BAMBOO TRAY home decor, jewelry, decor, decorations, electronics, fountains, floor mats, art glass, vases, garden essentials, fireplace screens. 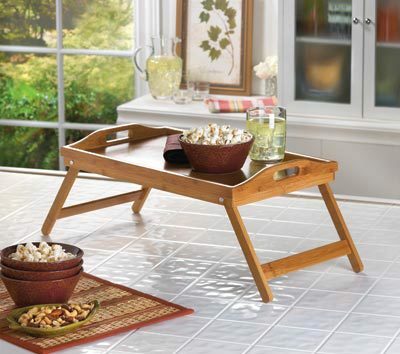 Versatile bamboo tray folds up for easy storage while not in use as a side table or serving tray. Designed with comfortable handles and raised edges to prevent spillage. Contents not included. Material(s): WOOD - BAMBOO. Weight 2.6 lbs. Dimensions 19.8" x 11.9" x 2.5".